Do you have a relationship that feels draining? A friend or family member that you don’t look forward to seeing or talking to because you know that they always need help with a problem? If so, you may be dealing with a Victim. A Victim is someone who usually feels overwhelmed by his or her problems and is powerless to them. They often feel vulnerable and constantly attacked by a Persecutor. More often than not, Victims don’t take responsibility for themselves and look to a Rescuer to take care of them. If you find yourself interacting with a loved one who behaves this way, then you may be taking on the role of the Rescuer without knowing. A Rescuer often seeks to “save” others, ignoring their own vulnerability to attend to a Victim’s needs. If a Rescuer stops helping the Victim, the Victim turns on them, seeing them as the Persecutor. From there, the cycle continues with a new Rescuer. 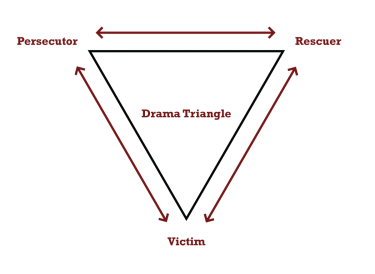 This emotionally draining and unhealthy pattern is known as Karpman’s Drama Triangle (as seen above). Anyone can play the three roles, and they can change depending on the circumstance. More often than not, regardless of who the Persecutor and the Rescuer are, the Victim will continue feeling victimized until they take on their own responsibility. The person who is a Victim uses their role as a coping skill. This is a learned trait that comes from fear of abandonment and being rejected. When someone is codependent, he or she uses their vulnerability to keep friends and family members from leaving. Unfortunately for them, this often backfires, causing the Rescuer to feel too drained to continue with the relationship, resulting in them abandoning and rejecting the Victim in the end. If you have a Victim in your life, there are ways to remove yourself from the unhealthy cycle so that you do not get stuck being their Rescuer or Persecutor. It’s important to set boundaries in unhealthy relationships to keep yourself from getting hurt. Limit your time with a Victim to maintain a balance in your own life. Don’t drop everything you’re doing when they are having a “crisis;” it is usually not as urgent as they make it seem. When you tend to every one of their problems, you’re enabling their behavior and letting the cycle continue. When you do set boundaries, the Victim may escalate, becoming more dramatic to try to get the Rescuer to come save them. Just remember that the behavior will get worse before it gets better. The key is to not save them. By not playing the Rescuer, you are allowing them to take responsibility for their actions. It’s hard at first, but this is the only way to achieve a healthy relationship in the future. The only exception is if their behavior involves self-harm or harming others, but that should not be dealt with by only you. Get them the appropriate, professional help that they need for the situation. After setting boundaries and removing yourself as the Rescuer, their behavior will began to modify. The hope is for them to recognize the importance of a healthy and equal relationship. For the Rescuer, it’s important to realize that it can’t be 90-10 all the time. You may want to help others, but without allowing others to help you, it will become exhausting. Asking for help and being vulnerable is part of being in any relationship, so allow others to experience the joy of serving too. Talking openly and honestly with your loved ones is best way to establish everyone’s needs without the relationship becoming one-sided. If you feel that you’re stuck in Karpman’s Drama Triangle, counselors at Stenzel Clinical will help you get out. Don’t let yourself stay in unhealthy relationships. With help, you can find a balance and have less draining, and more satisfying, interactions with your loved ones.